Ten Ton Hammer | Brewfest is Back! Normally, Brewfest by itself wouldn't be that newsworthy, but since Blizzard is so great at making tons of updates all the time, we can have fun looking at what's been going on over the last few days, along with taking a look at Brewfest. Brewfest runs through October 6, in Ironforge for the Alliance and Orgrimmar for the Horde. Additionally, beer gardens are set up outside of Silvermoon, Darnassus, the Undercity, Stormwind, Thunder Bluff, the Exodar, and Shattrath. What can you expect at Brewfest this year? 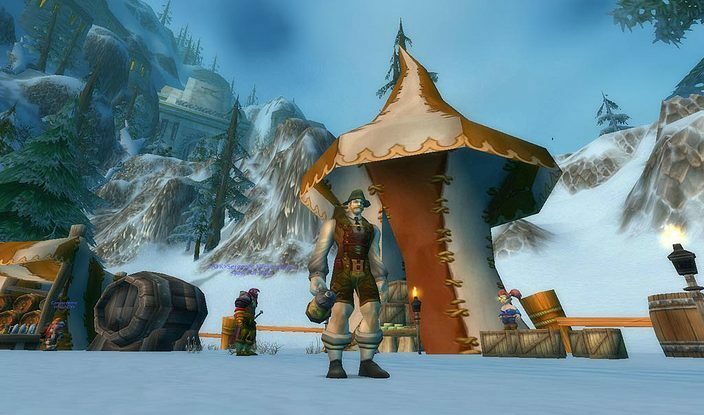 It's looking pretty much like Brewfest most years. Ram and Kodo mounts are available, so why not grab both? I highly recommend them for all of you Gnomes out there. The loveliest of Brewfest pets, the Wolpertinger (jackalope) and Pint-Sized Pink Pachyderm (tiny pink elephant) make their combacks. If that's not enough, there are plenty of costume pieces, a drunken remote control to dig your way directly into Black Rock Depths, and all of the seasonal food you can get in-game drunk on to get you through til the 6th. I already wrote about Episode Four of the Lords of War. Around the same time that Blizzard was announcing that, they also released the opening cinematic for Warlords of Draenor, warning everyone wanting to watch that these will, in fact, contain spoiler alerts. Rather than having unsuspecting community members stumble upon datamined cinematics from the Public Test Realm, Blizzard decided to release the cinematic early and just let everyone know that, hey guys, spoilers be ahead. So, you've been warned. If you saw this on the World of Warcraft set, then you even got warned in red. Super warned, OK? So, like, spoilers. So many spoilers that the page for the cinematic has not one, but eight embedded videos that all start with a two minute “spoilers ahead” clip. Wait. WTF. Eight spoiler alerts? Well, yeah. Blizzard wanted to make super extra sure that you know what's going on. Each real video has this spoiler ahead of it. While it lasts two minutes before jumping to the second video – the real video – of the playlist, you can also click on an option that will advance you to the next video faster. Each of the eight actual videos are parts of different cinematics you will experience throughout Warlords of Draenor. You won't have to blow all of your cinematic goodiness all in one shot! I haven't watched these. As silly as it might sound, I really do want to save these for when I experience them in game. Expansions are sort of like New Game Lite for me. You don't get the full wonder of being a complete newb running around in a game you've never experienced, but you do get that sense of wonder on a toned down scale. Loading up Mists of Pandaria nearly a year after it was out was just as fantastic as loading up Wrath of the Lich King on the day the expansion came out. While I'm risking sounding trite here, I will say that there is something truly magical about that first experience, whether it's a new game or new expansion. On PTR, I haven't been able to move past looking at talents currently, which I could just do offline. Baby steps for World of Warcraft's newest expansion, while I have the sense of full wonder in Project Gorgon. If you absolutely must, here is the Intro to the Dark Portal, complete with spoiler alert to the playlist. Art Galleries have also been updated. There is new World of Warcraft wallpaper and art, while the player creations galleries have been updated to include cosplay. Some really awesome cosplay came out of SDCC and Gamescom, and with BlizzCon on the way, adding in this gallery is fantastic for the community. Since cosplay is all about assuming the role of the character you're dressing up as, I'm a little let down that Blizzard has titled it the “costume gallery”. The Warlords of Draenor pre-patch, which includes the new character models, is currently available on the Public Test Realm. Did you watch all of the cinematics or are you holding off for Warlords of Draenor to go live on production servers? Are you a cosplayer featured in the gallery? Show your stuff, whether you are or not, in the comments below! Do you have any goals this year for Brewfest? Personally, I'm only playing PTR until WoD goes live. If you're testing, as well, be sure to say hi to Vendolyn!